A variant of Urban Zombie Drill for one player and a city full of construction sites. Walk around the city, either aimlessly or with a goal in mind. 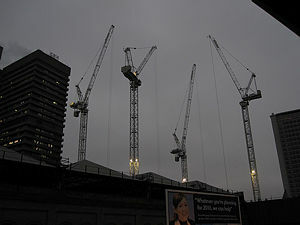 Every crane you see is a Martian Tripod, and if you can see the very top of the crane, it can see you. (If you haven't noticed it, then it hasn't seen you, but you shouldn't deliberately avoid looking in directions where there might be - or definitely is - a tripod.) Whenever you notice a tripod, you have ten steps to get back into cover so that you can't see it - if you can't do this, then it fires its heat ray and you die. Buses are evacuating people to the ports, and you can catch one if you like. If you see a Tripod from the bus window, though, the tripod fires and the bus bursts into flame - you must get off at the next stop, and continue play as normal. If a Tripod can see you when you alight, you get the usual ten steps from the bus stop to find some cover. Resistance: Certain people on the streets are Soldiers; pick an identifying trait for them (wearing a green coat, carrying a rucksack, wearing a hat) before you start the game, such that no more than one in ten of the people you see will possess it. Whenever you see a Soldier within shouting distance, they are counted as having teamed up with you. If you get within 100m of a Tripod without having been hit by its heat ray, and have at least five Soldiers on your side, then that Tripod is destroyed and has no further effect on play. Having destroyed a tripod, all of your Soldiers leave you. This page was last modified on 5 September 2017, at 11:19. This page has been accessed 17,006 times.